Home For Sale Tips - Why hasn't it sold? Brian McMahon specialises in selling properties that have not sold, click the tabs in our Selling Manual to see how we can get the job done. We look forward to going to work for you! Reference: Dr Fred Grosse Ph.D. Founder and CEO of the Institute for Management, Organization and Motivation. Consultant and mentor to the Top 1% of Real Estate Agents worldwide. 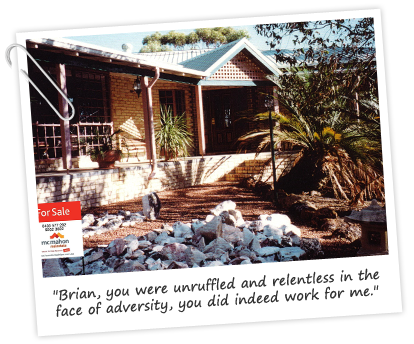 "I have worked as a consultant and mentor in the Australian Real Estate industry for over 15 years. During this time up to two thousand realtors have participated in interactive seminar programmes with me. It is fair to say that within the seminar format I get the “measure” of a person. There have, of course, been a few people who have really stood out. Brian McMahon, from Perth, is one of those people. I would rate him in the Top Ten. I’ve had the privilege of working with Brian about twelve years now. Whenever we discuss a course of action, he courageously and persistently takes it on. He does the “right thing” – even when others are doing something else. That takes wisdom and integrity. Because of who he is, Brian inspires trust and confidence in the people who work with him. He tells the truth all the time. He leads gently and with clarity. He carries the authority of one who has been in the business for 25 years and knows what to watch out for. As a result, he gets what he sets out to achieve virtually all the time. On the personal side, Brian has managed to maintain his charm and sensitivity in a field which could turn people into leathery sceptics. His outstanding professionalism has made him a true leader in his field and I’d say that any client of Brian McMahon will not only earn a lot, they’ll learn a lot – this is a man who has a lot to share. "